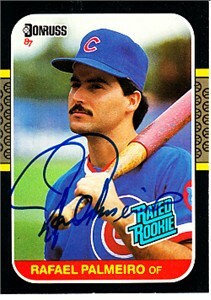 1987 Donruss Rookie Card autographed in blue marker by 500 Home Run Club member Rafael Palmeiro. With certificate of authenticity from AutographsForSale.com. ONLY ONE AVAILABLE FOR SALE.